Following the end of the Group C era around 1994, Toyota decided to alter its plans in sports car racing by moving to the production-based GT classes for 1995. Toyota announced they would skip the 1997 24 Hours of Le Mans to be able to develop their new GT car for 1998. Toyota Team Europe (TTE) and Dallara were charged with development of the new GT car. With taking the one-year hiatus, TTE was able to look at what the competition was developing for the GT class, and exploit it to their benefit. TTE realized that they would actually only need to build a single production car in order to meet homologation regulations, thus allowing TTE to have a car that would never truly be sold to a customer, meaning that any driver luxuries could be left out. TTE designed and manufactured the car's carbon fiber chassis and bodywork in-house, while Toyota supplied an upgraded version of the engine they originally used on their Group C cars, the Toyota R36V, 3.6 litre Twin-Turbo V8. Introduced in time for Le Mans in 1998, the GT-One first appeared at the official testing days for the race held in May. Three GT-Ones appeared, setting the 2nd, 5th, and 10th best times, easily beating out custom built prototypes which were meant to be the superior class. For the race week itself, all three cars performed admirably in qualifying by continuing their quick pace, qualifying 2nd, 7th, and 8th, being beaten only by their GT class competitor, Mercedes-Benz. Following the success of the GT1 class as a whole over the Le Mans prototypes, the ACO and FIA moved to change the regulations for the GT classes, requiring a large amount of production vehicles for the GT classes, thus eliminating the original loopholes in the system. 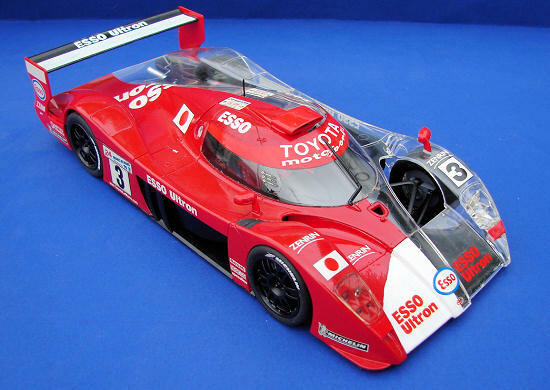 Thus Toyota was forced to make changes to the GT-One, as were all its competitors in the class. Toyota decided to follow the route of Mercedes and evolve the GT-One into a GTP class prototype. Although the CLK-GTR required extensive modifications to become the CLR, the GT-One was already close enough to a prototype that extensive redesign was not needed. Toyota began an extensive testing program, including a long distance test at Spa-Francorchamps soon after a snowfall. In the official testing session at Le Mans, the GT-Ones were again fast, taking the 1st, 3rd, and 5th fastest lap times. This pace continued in qualifying for the race, as the three GT-Ones took 1st, 2nd, and 8th positions. The lone GT-One would come home 2nd overall, one lap behind the winning BMW. As a consolation prize, the GT-One would win the GTP class, although it was the only car in the class to actually finish. The GT-One would race only once more, a single entrant appearing in the 1999 Le Mans Fuji 1000km. 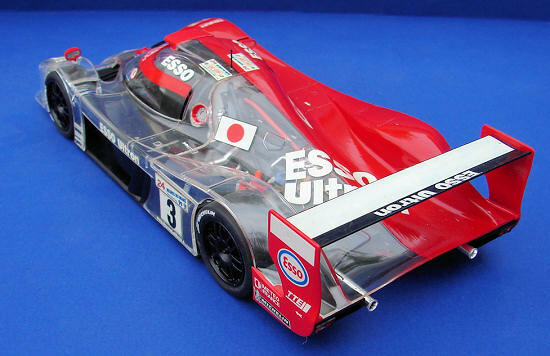 Although the race mostly consisted of Japanese teams, thus leaving out most of the manufacturers that had competed at Le Mans, Toyota still had to compete against rival Nissan, who also entered their R391. In the end the GT-One would fall short once again, finishing 2nd and only one lap behind the winning R391. The GT-One program would not be continued into 2000, Toyota instead turning TTE into leaders of the new Toyota F1 team. This would mark the end of Toyota's attempts at Le Mans, which had started in 1985. As anyone who has built one knows, Tamiya makes really nice car kits. This one is no different. The body is nicely molded in clear plastic with no blemishes or cracks. The rest of the parts are molded in white, black and silver plastic. A very nice set of rubber tires are included as well as tire emblems. There were really no problems with this kit. Construction begins with the engine and rear suspension. The turbos and exhausts are a bit of a handful and some test fitting will be needed here. The front tub is then assembled. The kit includes a driver figure that looks really nice. There is a separate instruction sheet for it, so you have to decide if you're gonna use it as it needs to be installed in the chassis before part #A27 in step 8. The cockpit and engine are joined to the bottom tray in step 9. Care should be taken when assembling the body. There are several parts that are added that are not clear and doing it without making a mess of the clear body can be a pain. Most of the chassis parts need to be painted before assembly. The suspension is particularly difficult to paint with all the tiny details. I followed the call-outs in the instruction sheet for the most part. Seeing how this was the clear version, I decided I was gonna paint it up half-n-half. I masked off the left side and sprayed the body with Tamiya bright red in the can. BAD IDEA! The Tamiya paint attacked the clear plastic and I was unable to save the body. So... I had to buy another kit just to rob the body parts out of it! This time, after masking, I sprayed the body with Testors MM bright red and had no further problems. After applying the red I masked it off and sprayed Testors Bright White on the nose. A bit of touch-up was required around the area where the red and white meet. Various parts that were molded in color also shot in red: mirrors, rear wing supports and roof intake. The clear parts did have a slightly darker hue to the red paint then the parts molded in white. I suppose a primer on the body might have helped. The decals went on with no trouble whether it was on the clear half or the painted half. The white decals are also thick enough that I didn't notice any change going from clear to red. The rear wing was left unpainted and the decals applied directly to the black plastic. I made it a harder build then it would be OOB, but I like the overall effect of the half clear body. 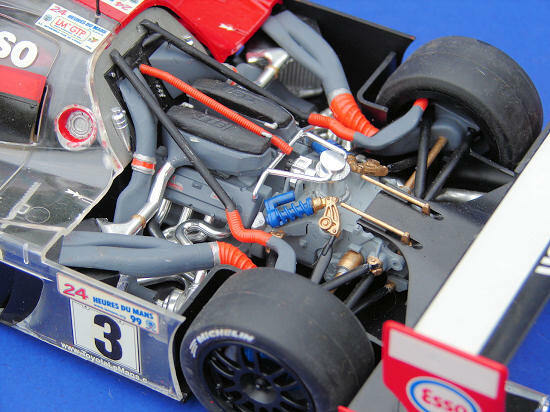 It has nice detail but I think Tamiya could have added a bit more with the clear body. It could benefit from a bit of added detail if one so desires. The clear body makes it hard to attach parts without making a mess of things, but that's a necessary evil if you want the clear body. For anyone who likes these car like I do, this kit is a must have.